Steinberg in Chinese child’s headgear, c. 1949. Photo by Bernard Rudofsky. February, rents studio at 38 West 59th St.
Spring, working on drawings for a mural of the city of Detroit for “An Exhibition for Modern Living,” a landmark design show at the Detroit Institute of Arts, and on proofs for The Art of Living, his second compilation of drawings. June 21, sails to France to meet Hedda, who has been there for three months. Meets author Saul Bellow, start of an enduring friendship. July-August, visits parents. ST and Hedda travel in Italy (Milan, Venice). August 27, they sail back to New York. Fall, publication of The Art of Living. September 11, opening of “An Exhibition for Modern Living,” where his 24 drawings are photographically enlarged and assembled as a mural. Catalogue cover for “An Exhibition for Modern Living,” Detroit Institute of Arts, 1949. 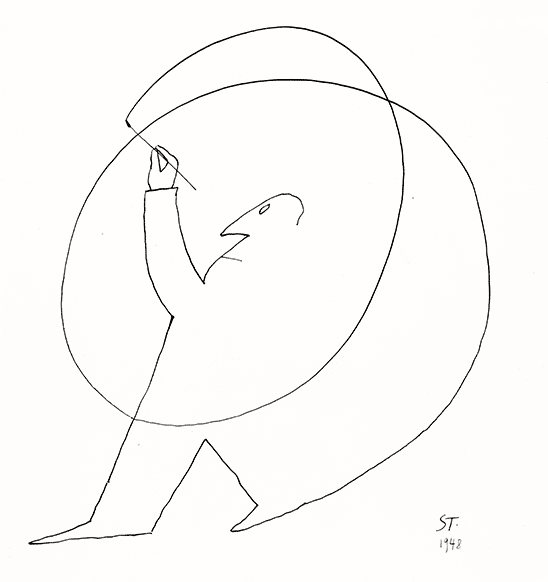 One of Steinberg’s drawings for his mural of Detroit at “An Exhibition for Modern Living,” 1949. Ink over pencil on paper, 14 5/8 x 23 1/8 in. Detroit Institute of Arts; Gift of the J.L. Hudson Company. One of Steinberg’s drawings for his mural of Detroit at “An Exhibition for Modern Living,” as reproduced in the catalogue, with color added. By December, his parents have resettled in Nice, where he continues to help support them.